Toyota Avalon Repair San Carlos, CA - A+ Japanese Auto Repair, Inc. In 1997 a Toyota Avalon was brought into A+ Japanese Auto Repair by a client needing an engine oil and oil filter change. Since that first visit we have seen many Toyota Avalon vehicles at our facility as well as the progression they have gone through becoming a reliable Sedan. The Toyota Avalon was first produced in Kentucky 1994. The Avalon also made it through the first generation into the second generation by 1999-2000. At this point the Avalon established itself as a more refined midsize platform than the Toyota Cressida which it replaced in 1994. In 2005 the Toyota Avalon went through another redesign an into its third generation. Toyota Avalon and A+ Japanese Auto Repair Inc. The third generation Toyota Avalon is larger than both previous generations. The third generation started production in 2005 through 2012 and is the most common Toyota Avalon we see at A+ Japanese Auto Repair Inc. This Toyota Avalon uses a 3.5 liter 2GR-FE V6 Motor. We are experts at service and repair on this Engine including the Dual VVT-i (variable valve timing) it incorporates. This Toyota Avalon also uses Toyota’s 5-speed sequential shift transmission. The Master Mechanics are also very familiar with this Toyota sequential shift transmission. The fourth generation Toyota Avalon has already started rolling out. There is expected to be a TRD (Toyota Racing Development) edition in 2013. With the anticipation of the Hybrid Toyota Avalon coming to market the technicians at A+ Japanese Auto Repair Inc. have been training on the Hybrid system. The Toyota Avalon Hybrid will still incorporate the 3.5L V6 Engine. We are experts when it comes to Toyota Avalon Repair & Service. We started working on Toyota Avalon vehicles when we opened in 1997. With numerous years of repairing the Toyota Avalon we are now known as the best alternative to the dealer for Toyota Avalon auto repair and service. 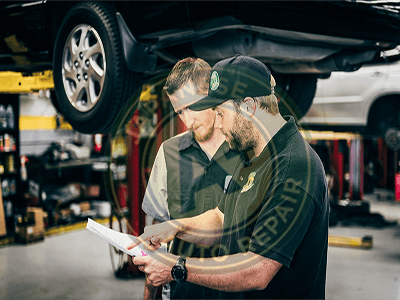 A+ Japanese Auto Repair uses ASE Master Certified Auto Repair Mechanics and the same high quality parts as the dealership. We perform these auto repairs and services at a far better price than the dealership. We also offer a 24 month / 24,000 mile warranty on all auto repair and service performed on your Toyota Avalon. Contact us regarding any questions regarding your Toyota Avalon Service Schedule. We look forward to helping you with any Toyota Avalon car repair and service you may need.